These 4' wide standard assemblies are commercial grade. While overkill for most applications, if you want the strongest leg system you can get, this is for you. These include all of the parts you need to hold up a dock section with a couple additions. 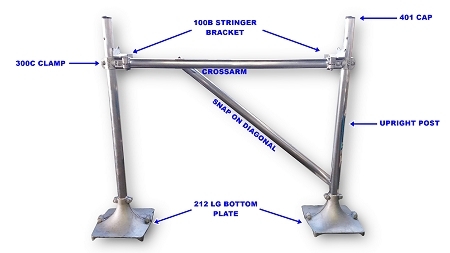 They include aluminum dock posts, crossarms, post caps, large heavy duty bottom plates, a snap-on diagonal brace, and stringer brackets. All parts come with hot dipped galvanized hardware. Individual parts are available if you do not need the whole set up. The commercial grade setup is very useful for deeper water or rocky bottom applications. A straight out dock will need one of these for each section. The sections share the standard assembly. This keeps everything tied together.